Jim Carr is Canada’s Minister of International Trade Diversification. Following early careers in music and journalism, Minister Carr entered public life in 1988, when he was elected to represent Fort Rouge in the Legislative Assembly of Manitoba. He was also the deputy leader of his party. He later went on to become the founding CEO of the Business Council of Manitoba, where he worked alongside business leaders to address issues critical to Manitobans and Canadians. 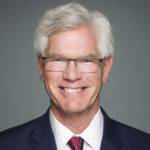 Minister Carr has been a minister since 2015, previously serving as Federal Minister for Natural Resources. Global Affairs Canada manages Canada's diplomatic and consular relations, promotes the country's international trade and leads Canada’s international development and humanitarian assistance. Its Trade division is tasked with opening new markets for Canadian companies and promoting trade opportunities; promoting Canada as an investment destination; and supporting the pursuit of commercial success by Canadian companies and investors in key foreign markets. 1- Although the US will continue to be Canada’s most important trading partner, the Asia Pacific region shows great promise for trade diversification, wealth creation and job growth. 2- Canada is valued as an investment destination and trading partner because of our educated workforce, adherence to a rules-based trading system, stable political system, diverse labour markets, natural resource riches, and our commitment to innovation and R&D. 3- A combination of international trade and investment attraction, especially through SMEs, will lead to greater competitiveness, economic growth and job creation for Canada. Broadening and deepening our access to global markets is essential to job creation. More than that, diversification also refers to who is engaged in trade. We need all ambitious Canadian entrepreneurs and business people to think global and take advantage of the opportunities from new free trade agreements, such as CETA and CPTPP. How do you view Canada’s position in the world today when it comes to international trade? Canada is very well positioned. Because of the trade agreements we have signed, we have unparalleled access to lucrative and fast-growing markets across the globe. Canadians should feel confident that we are poised to become the most globally connected economy on earth. We now have free trade relationships with 51 countries, creating a pool of over 1.5 billion consumers. We are the only G7 nation that has free trade with all the others. We have set an ambitious target to diversify our trade so that 50% of our exports go to non-US markets by 2025. We are also focused on giving exporters and would-be exporters of all sizes the confidence and capacity they need to turn these deals into their own prosperity. The inclusion of the word “diversification” in the name of my ministry is intentional and impactful. It means that Canada wants to look at ways of deepening and broadening its trading relationships around the world. It also means diversification of who has access to our trading relationships. That means getting more women, Indigenous peoples, youth and newcomers into new markets. That means making sure even the smallest business knows how to reach us and in turn, make their first global sale. This is a critical part of how we enhance our competitiveness and the Fall Economic Statement has provided $1.1 billion in new resources to build trade corridors from every corner of the country to the world. Those resources also include $340 million for programs that directly support businesses in building their business plans, networks, sales numbers and access overseas. We talk an awful lot about distributing wealth and about who gets what piece of a national pie, but we have to grow the pie. The way that we generate more wealth is through, among other avenues, trading relationships that then create jobs. So, we look at areas in the world where we find the potential for job creation in Canada to be strong. The Asia Pacific region shows tremendous potential in this regard. One of the first trips I took in my role as Minister of International Trade Diversification was in the Southeast Asia Pacific. The region is dynamic and fast-growing, with economies bursting with potential for its countries and the nations it trades with. To get to a free trade agreement, countries look for an alignment of interests and the objective is to create jobs and wealth for all parties. At the same time, there are protectionist forces in the world. Canada is reasserting its commitment to the system of rules that has served us well since the end of the Second World War. We know that the World Trade Organization (WTO) can be improved to better serve all countries. That is why we convened 11 like-minded countries and the European Union for a Ministerial on WTO Reform in October 2018. Together, we agreed that a rules-based system is fundamental for international trade. We will continue that conversation through 2019. What is Canada’s approach towards trade with the United States? Our relationship with the United States will continue to be the most important one we have. This is a result of history, geography, and institutional and personal attachments. We shop at each other’s malls, we go to each other’s universities, we marry each other, and we have been connected through families for a very long time. More than 70% of all of our trade is with the United States and there is every reason to assume it will continue to be our most important trade partner. There is shared commitment across the board and both sides know that Canada-US trade is a pillar in support of both of our economies, and the workers and their families that have benefitted from it. How is Canada doing in terms of attracting foreign investment? Meetings I have had with CEO’s of multinationals or heads of sovereign wealth funds in the US, Europe, Japan, Singapore and more have confirmed a couple of key points: those who know us, like us a lot, and virtually all are making plans to expand their presence in Canada; those who are just getting to know us are impressed with the tools we have at our disposal to attract and retain investment. 2018 saw some tremendous successes in Canada: Toyota’s $1.4 billion expansion into its world class investment facilities in Ontario – following closely on the heels of Ford and Honda making significant investments in 2017; the long line of AI companies landing in Montreal, Toronto, Vancouver and elsewhere around the country; several companies adding to their global cybersecurity footprint with investments in New Brunswick; and of course just a few months ago, the $40 billion LNG Canada project, with 5 countries participating – the largest-ever private sector investment in Canada. And let’s not forget, for the first time since 2017, Canada’s tech sector has attracted more global talent to our 3 main tech hubs than has gone to Silicon Valley and Seattle combined. This is a significant shift, and is an important signal to talent and investment capital globally that Canada is on the move. In the first 3 quarters of 2018, Canadian businesses attracted more foreign direct investment than all of 2016 or 2017. But we know that a brief uptick does not satisfy our long term goals; sustained growth of more capital, through more deals, into more sectors, from more sources, creating more jobs. And that’s exactly why Invest in Canada was created – to highlight Canada’s competitive advantages, and to accelerate the decision-making process of investors around the world. How does the regulatory burden on large projects affect foreign investment in Canada? Investors are always looking for certainty and predictability, and the changes that we introduced to the regulatory system through Bill C-69 will make the process more predictable and certain, particularly at the front end. We are bringing in better rules that mean shorter timelines for reviews, streamlined processes between federal and provincial reviews, and clear requirements. These measures are good for competitiveness and good for jobs. Foreign investors need certainty and that’s what C-69 provides. The Superclusters Initiative that we announced invested almost $1 billion in incentivizing the private sector. That includes clusters focused on artificial intelligence, advanced manufacturing, protein industries, digital technology and oceans. There is also incredible growth potential in areas like cleantech where Canadian companies can count themselves among the very best in the world. In fact, 13 of the 2018 Global Cleantech 100 are Canadian businesses. We have carbon-capture businesses like Halifax’s Carbon Cure, which signed an agreement with PanUnion during my latest visit to Singapore, or Pyrowave in Montreal, which is revolutionizing recycling technology. Renewable sources of energy and more sustainable ways of developing conventional energy are picking up, so there is every reason to be optimistic. Lastly, I’d say that we are focused on getting all ambitious Canadians in trade. By leveraging the entrepreneurial power of women, Indigenous peoples, youth and more, Canada’s capacity to create wealth linkages around the world will dramatically increase. We are actively working to diversify not only the countries we trade with, but also the Canadians who trade with the world. The Canadian economy is diverse and it’s time to diversify further by engaging those who have not been in a position to participate fully in it, such as Indigenous peoples, women and small business owners. The Trade Commissioner Service (TCS) is there to support Canadians looking to export, and I encourage those interested to get in touch with our experts there.